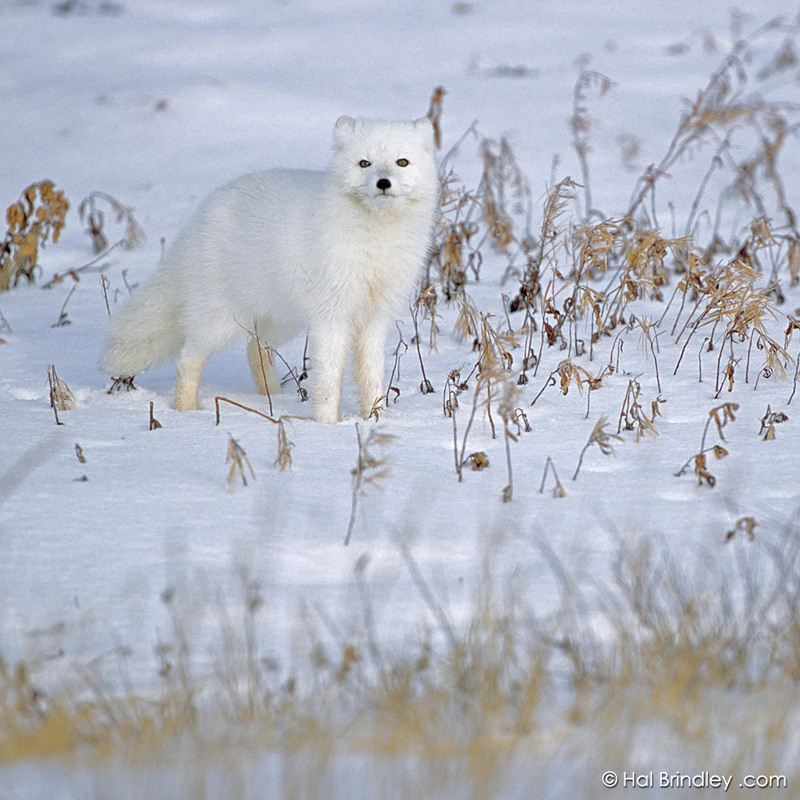 I traveled to Canada to visit the tundra in Northern Manitoba along the Hudson Bay. There is a tiny town called Churchill accessible only by train or plane. 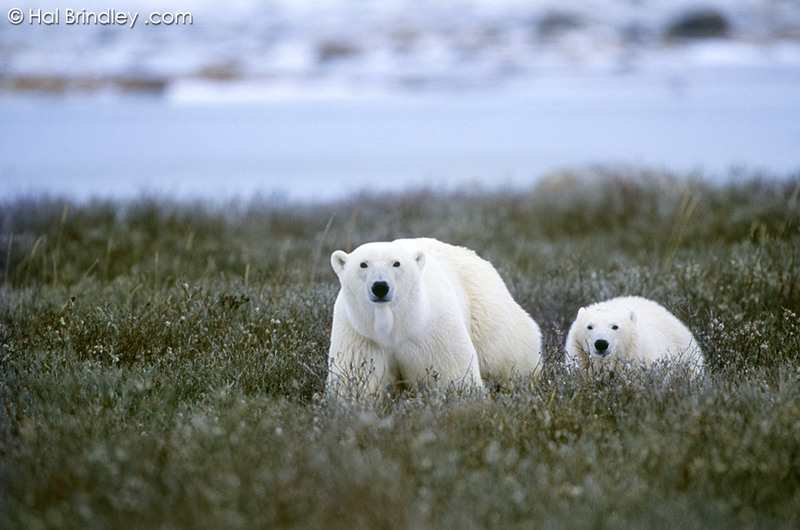 Each year, in October and November, polar bears collect along the bay. 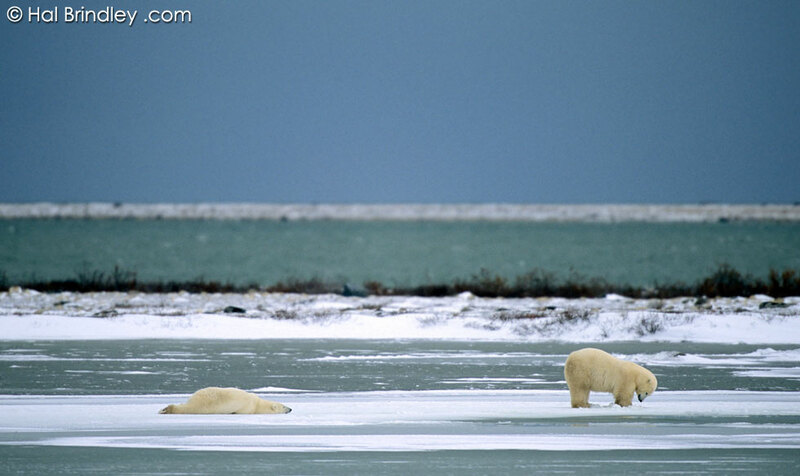 Here they wait for the water to freeze so they can go out on the ice and hunt their favorite prey, seals. 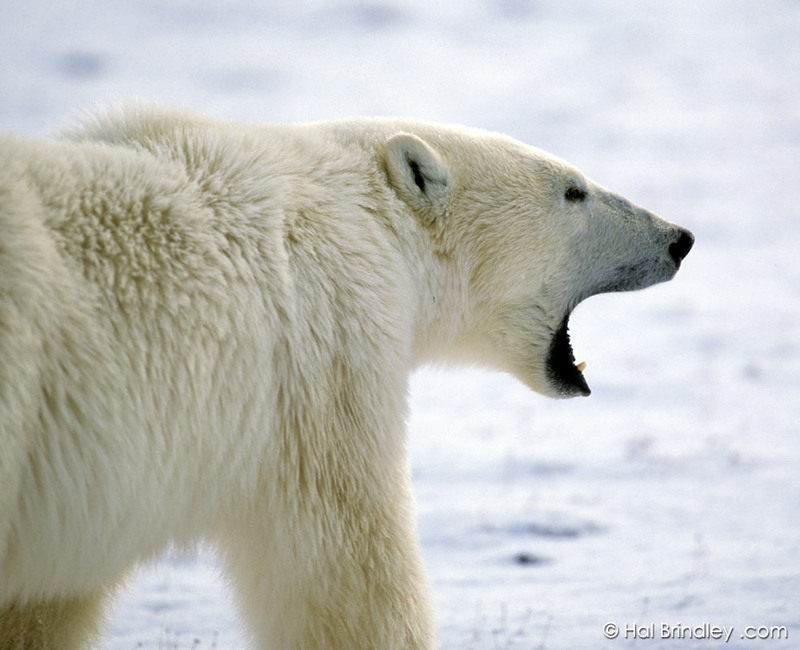 The polar bear is the world’s largest land carnivore. Males can weigh as much as 1500 pounds. They are a deadly predator. 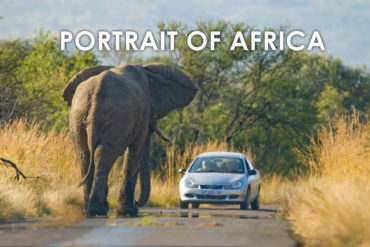 I photographed this large male from the window of our rental car. He was strolling directly toward me. This was as close as I dared let him get before yanking my camera back inside and closing the window. Then Abigail stepped on the gas. 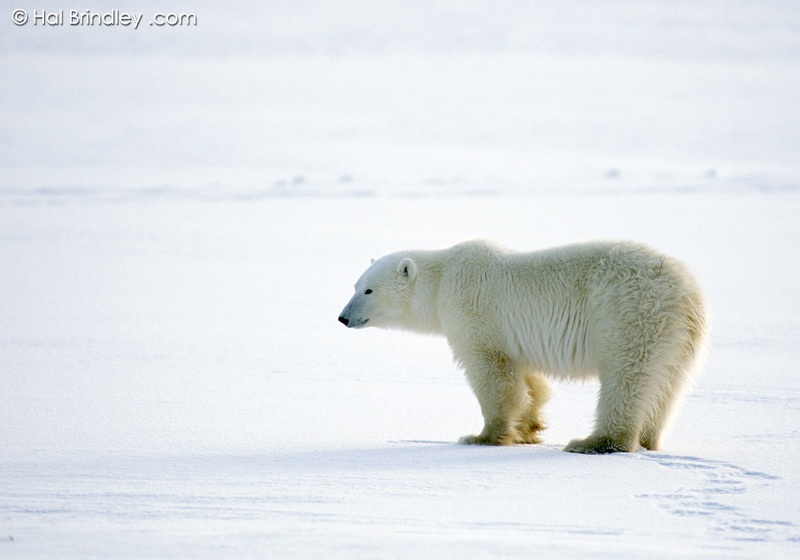 Polar bears are normally solitary creatures, traveling alone over the arctic pack ice. 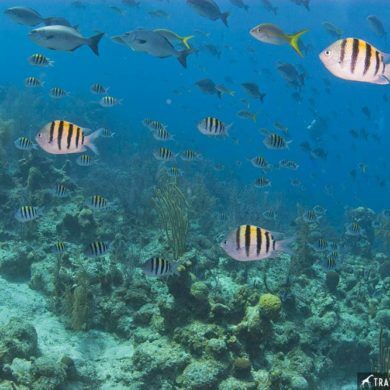 Some have home ranges as large as 100,000 square miles! 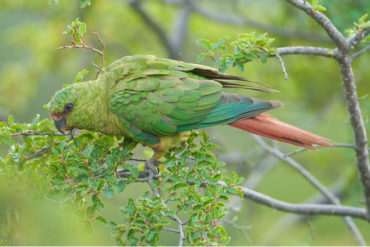 With an estimated world population of only around 20,000 to 30,000 (hardly enough to fill the seats in a football stadium) you can imagine they are extremely difficult to find in the wild. 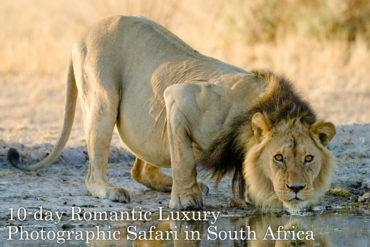 With wildlife photography you have to be in the right place at the right time. 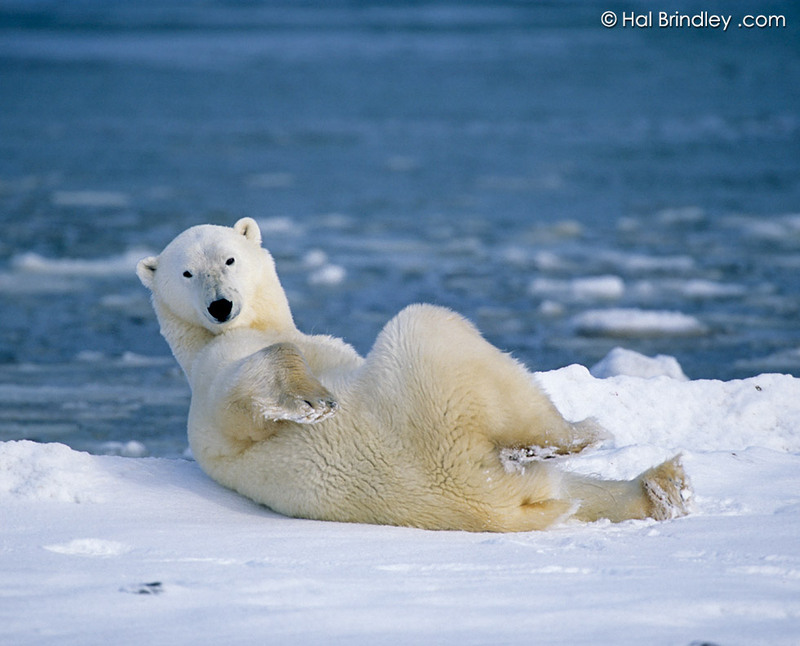 Luckily, for polar bears, there happens to be a right place and a right time. 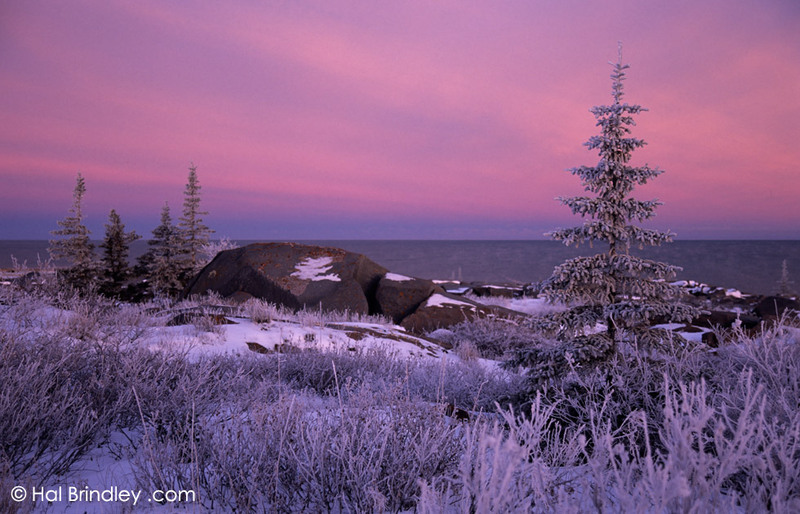 Churchill, Manitoba in late October. 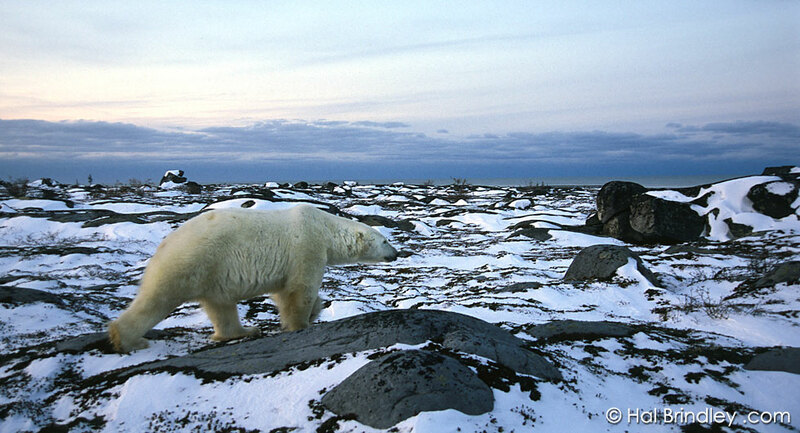 It is one of only two places in the world where one can predictably see a polar bear. 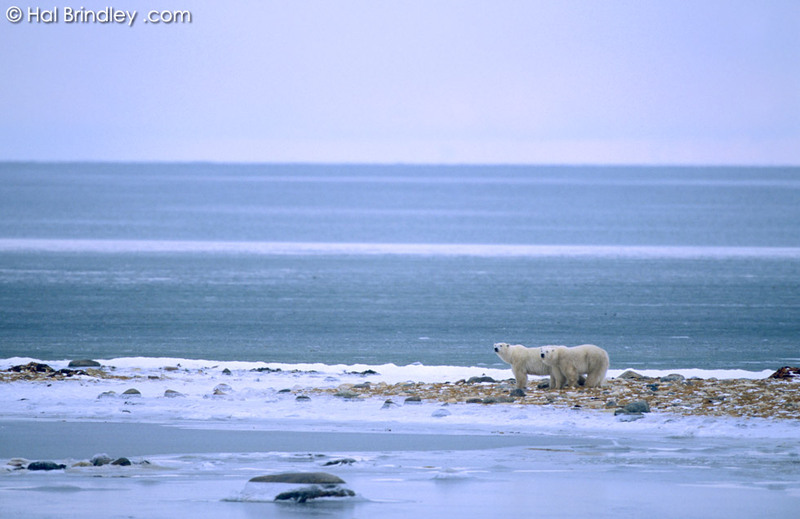 (The other being Wrangel Island in Russia which is virtually inaccessible). 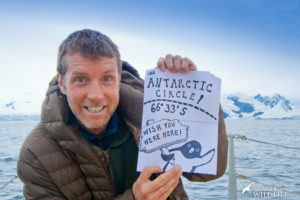 This is because Churchill is at the very southern-most point of the polar bear’s range. 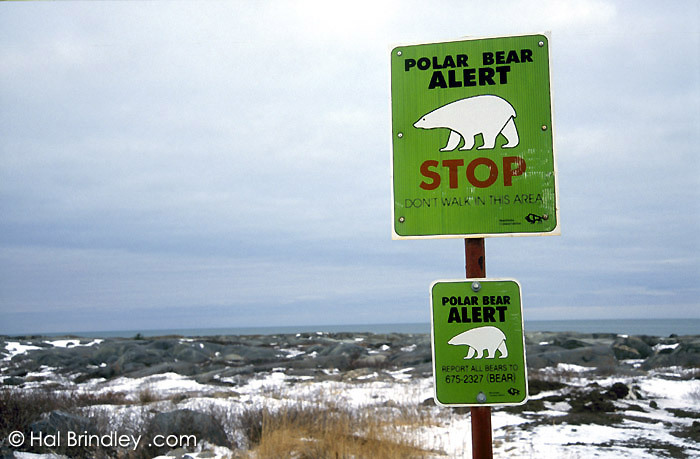 Here the bears are forced to go ashore each summer when the bay melts. 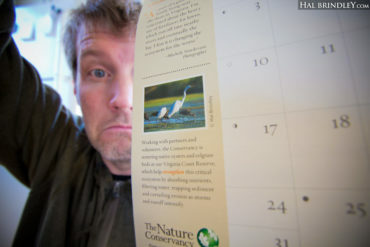 They may go as far as 50 miles inland to wait out the season. By fall, the bears have gone several months without eating. Interesting fact # 1: Bears are the only mammals that can survive more than 6 months without eating, drinking, peeing or pooping. Nothing in, nothing out. For 6 months. 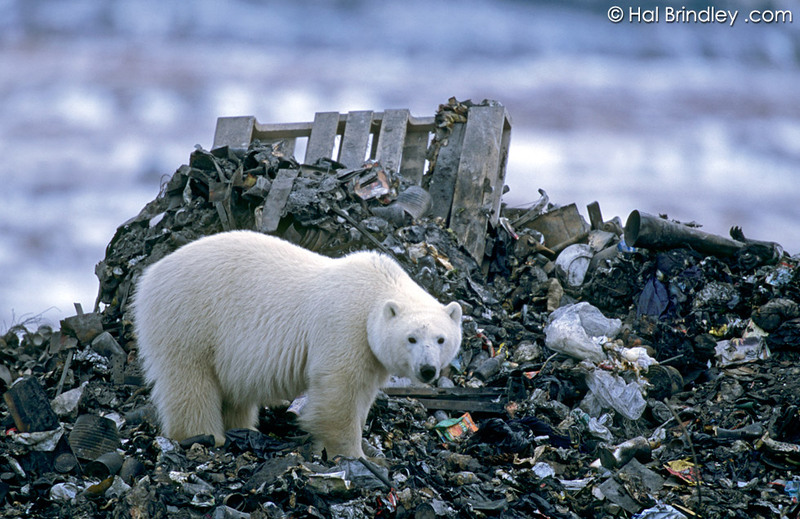 Polar bears can synthesize water and protein biochemically from their waste product. This is an amazing feat, folks. 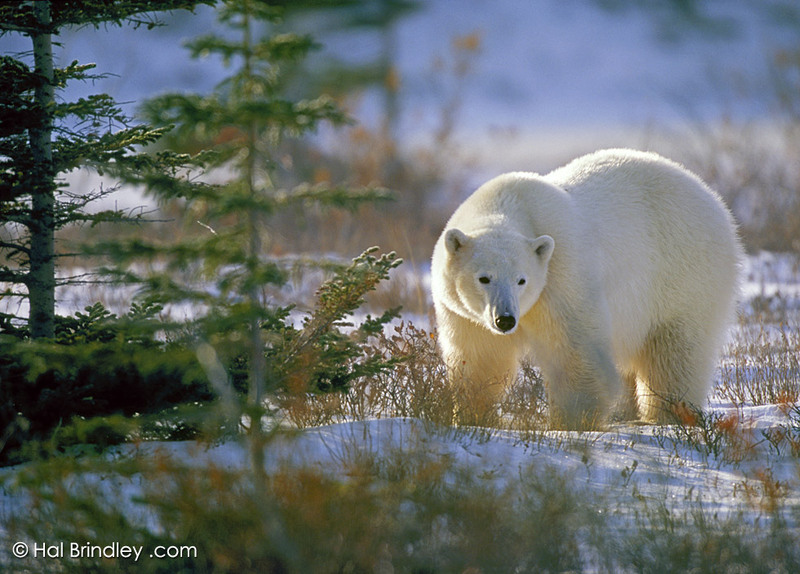 Pregnant females around the Hudson Bay do not feed for 8 months, during which time they must support themselves AND supply milk to their newborn cubs. For most of the bears around the bay it has been about 4 months since their last meal. 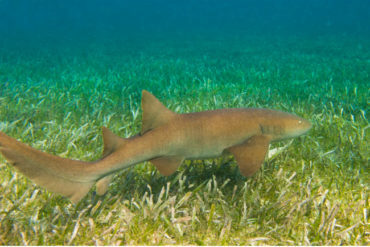 However, as shown in this photo, they do occasionally eat kelp (seaweed) and grasses for a little snack. 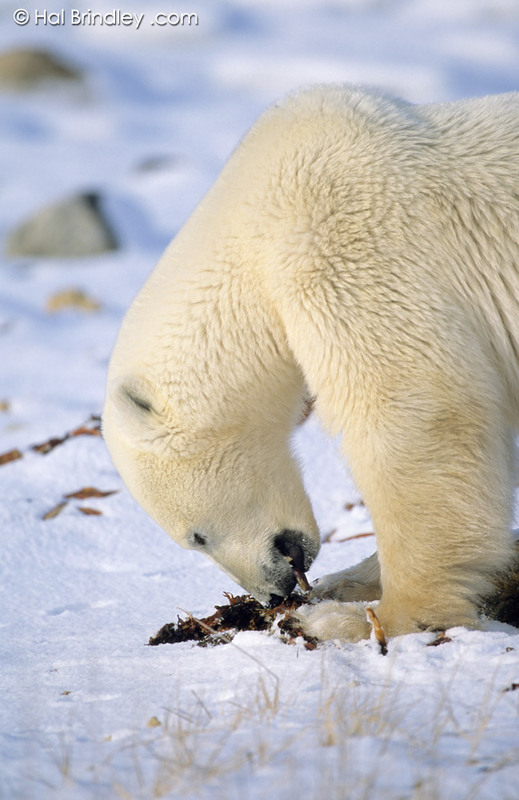 Interesting fact # 2: Polar bears have one of the most powerful noses in the animal kingdom. 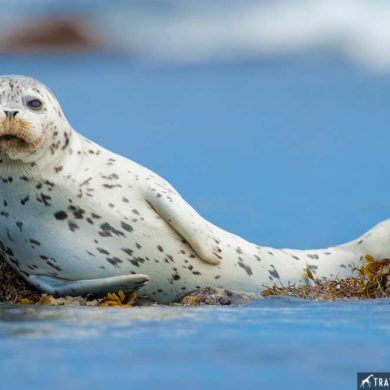 They can smell a seal under 4 feet of packed snow from a distance of over half a mile. 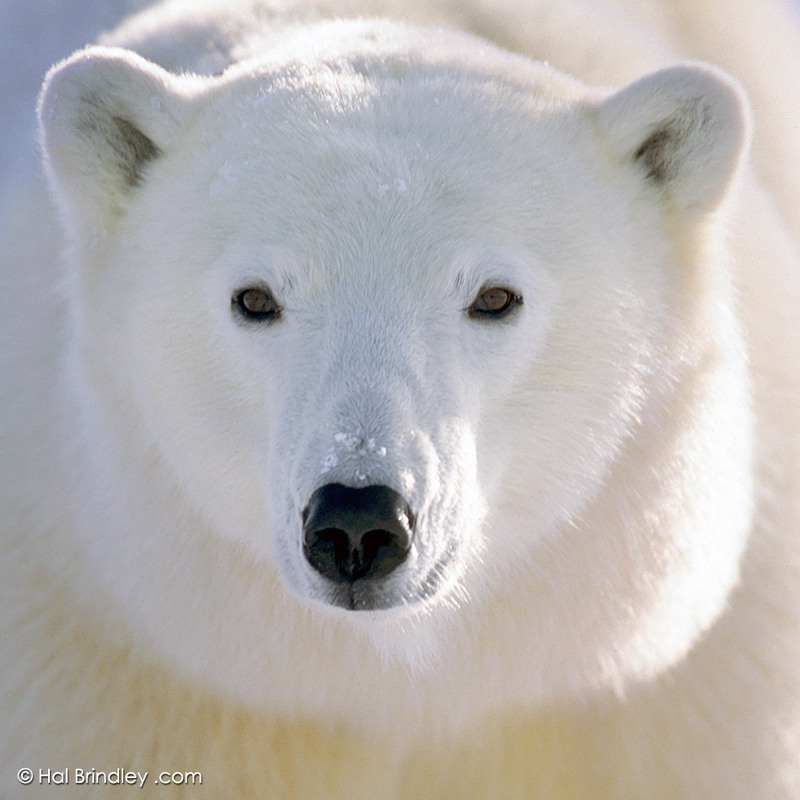 Interesting fact # 3: I’ve heard many times that under all that white fur, polar bears have black skin. I dare you to try shaving one to prove me wrong. 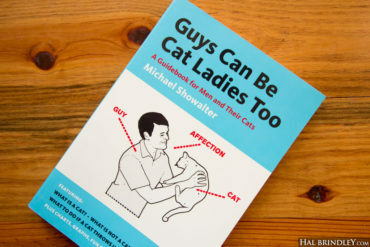 However, after printing that fact here on this page I was contacted by a zoo veterinarian who actually DID shave a polar bear and said the skin was pinkish gray. This photo does not show a roar of aggression, simply a casual yawn. 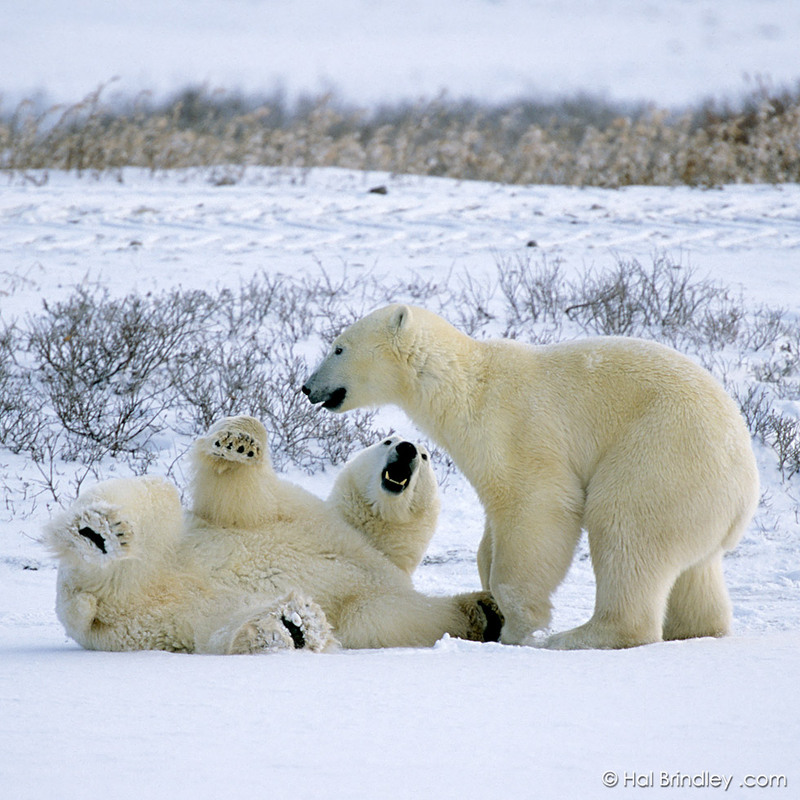 Interesting fact # 4: Polar bear cubs weigh only about 1.3 pounds at birth. Compare that to the weight of an average female, about 600 pounds. That would be like a human giving birth to a baseball (a 5 ounce baby). Sounds like a much more sensible system really. The cub in this photo is probably about a year and a half old. Cubs will stay with their mother for two and a half years before they are sent out on their own. 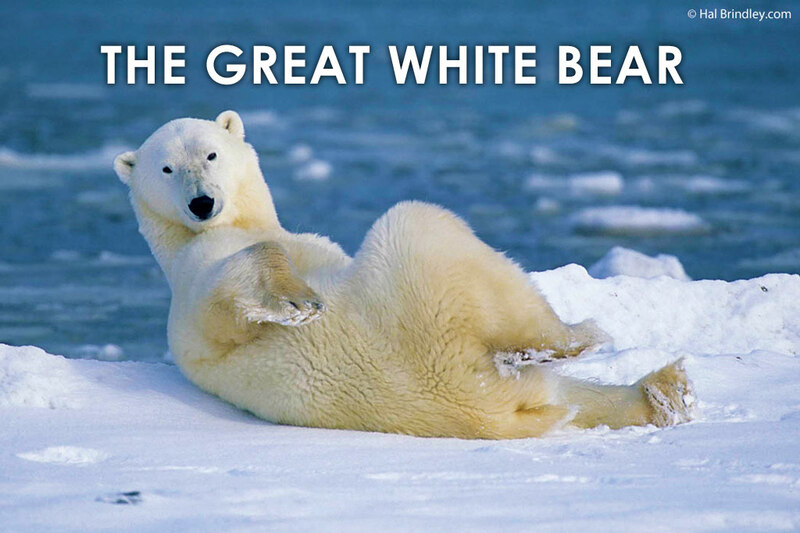 I think what I love most about polar bears is their parodoxical nature. On one hand they are one of the world’s biggest, most terrifying and dangerous monsters. They make a living by slaughtering baby seals for crying out loud! On the other hand they are, without a doubt, one of the world’s most adorable creatures. If seeing a polar bear flopped on its belly does not make you smile then there is something very wrong with you my friend. Don’t you just want to cuddle them? I suppose that would be a very bad idea. Which brings us to our next point. 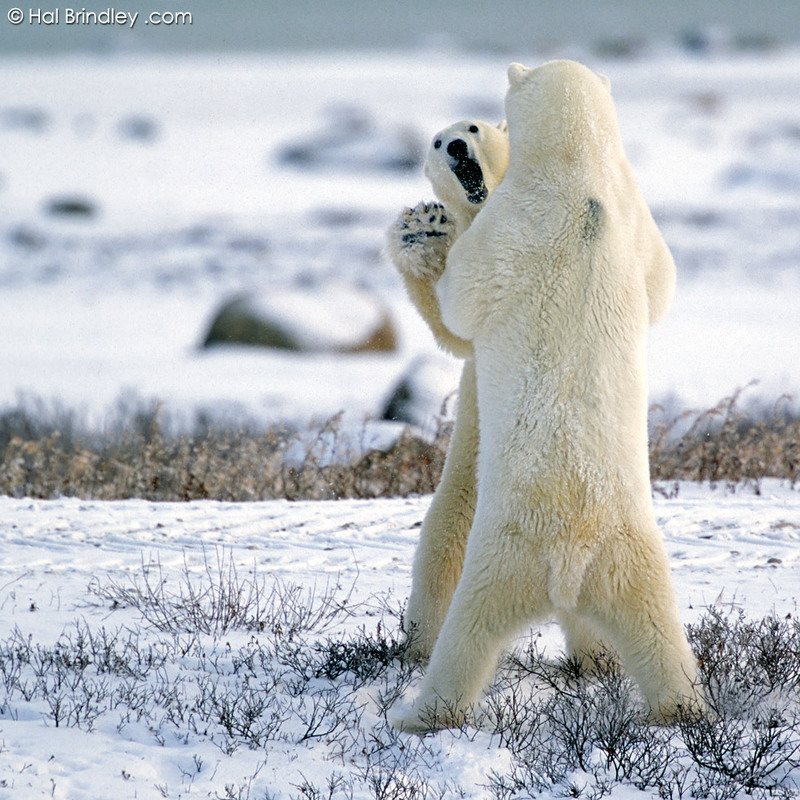 What do bears do to entertain themselves while waiting for the ice to form? Often they’ll try to kick each other’s asses. 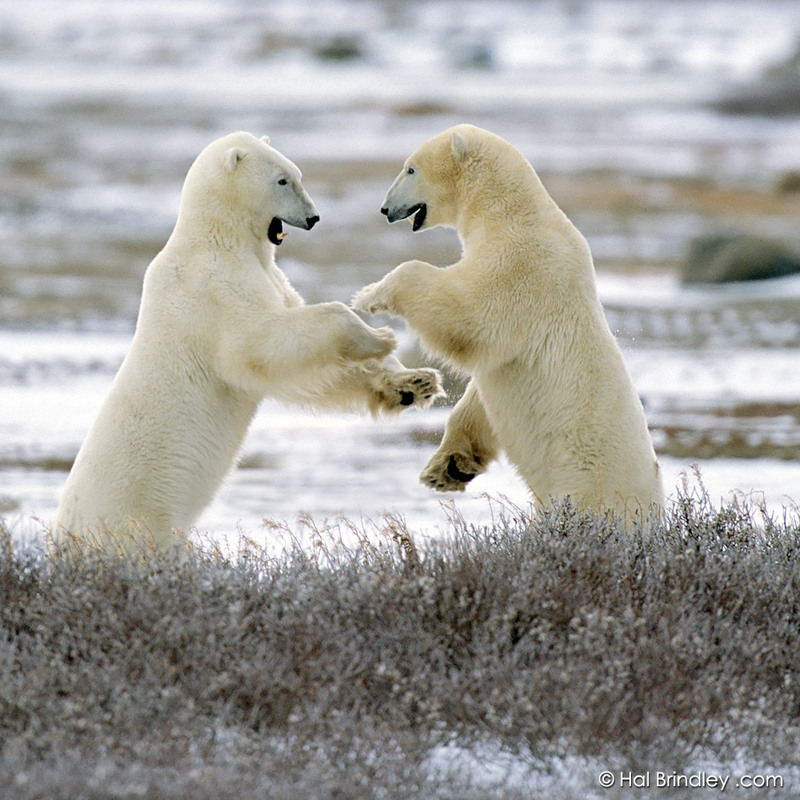 Researchers refer to this as sparring, something young males tend to do around Churchill. A study is being conducted to determine the reason for this behavior. Of the four hypotheses, boredom was not mentioned. 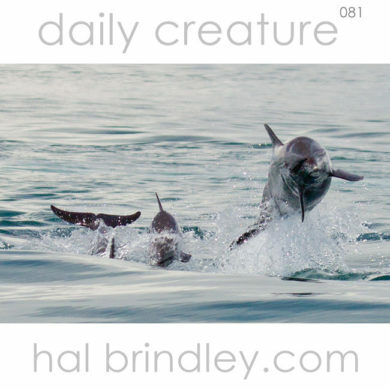 More likely they are testing their fighting skills or establishing a dominance ranking. Sparring matches can look pretty ferocious. 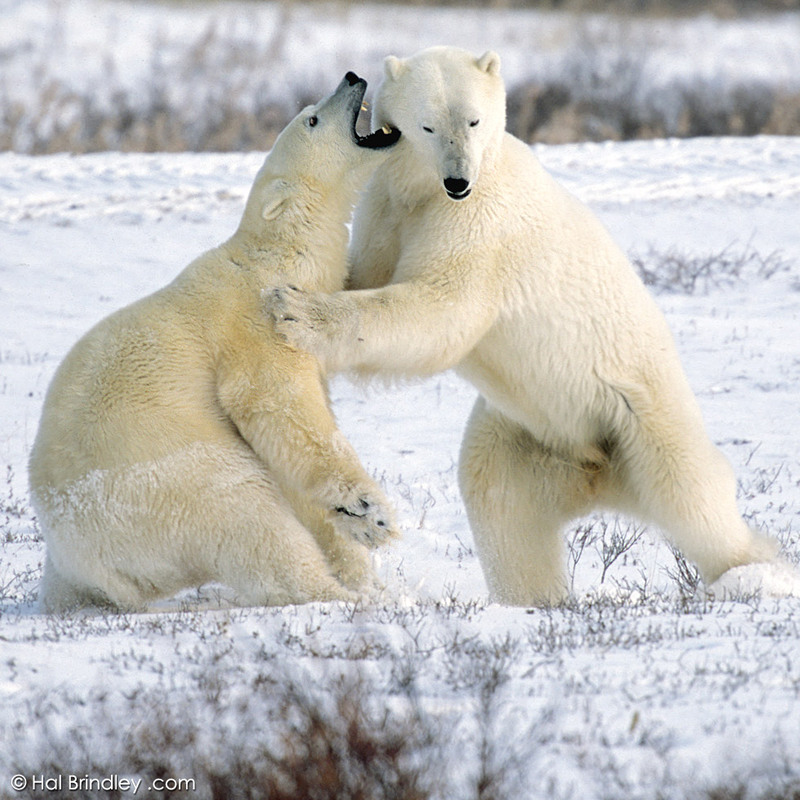 The bears rear up on their hind legs, they shove and swipe and pounce on each other, knocking each other to the ground, wrestling and biting each other’s necks. But usually it all seems to be in good fun. These were definitely some of the most exciting moments, watching these thousand pound beasts have a knock-down-drag-out. These shots were not taken from a rental car as it is not possible to drive into the areas where most of the bears congregate. So how did we do it? It’s not as difficult as you might think. Although it is expensive. Those folks you see sticking their heads out of the window of a custom built “tundra buggy” are paying $175 a day. I was one of those folks. As you can see, it is impossible for a bear to kill you under such circumstances, although the lady in the window above is trying her darndest to lose an arm. No, it really is an awesome service they have created. 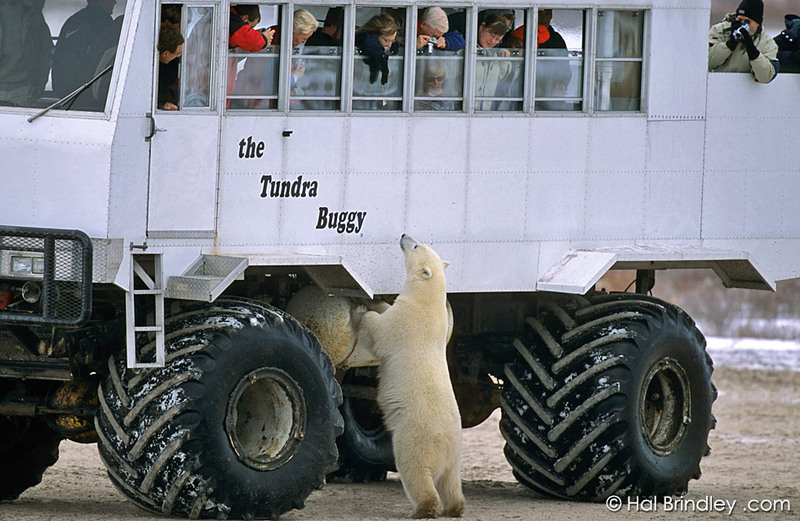 Between Tundra Buggy Tours and Great White Bear Tours there can be as many as 18 vehicles out cruising the tundra at once. 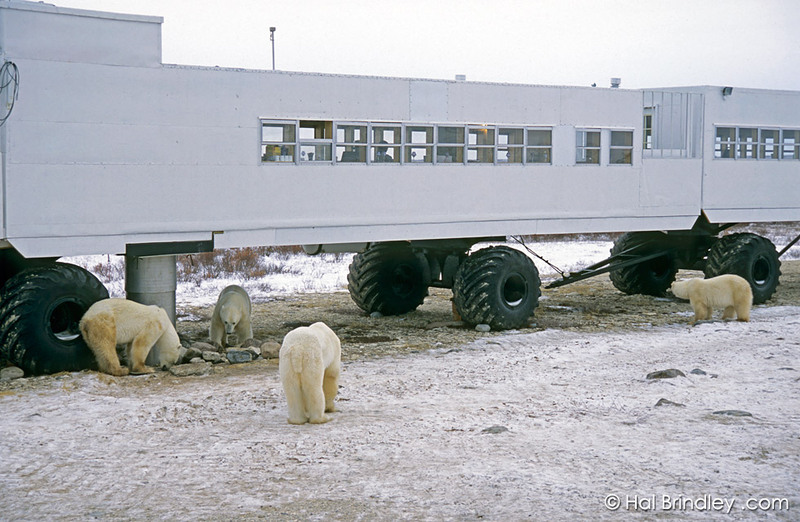 If you want to see polar bears, this is the way to go. 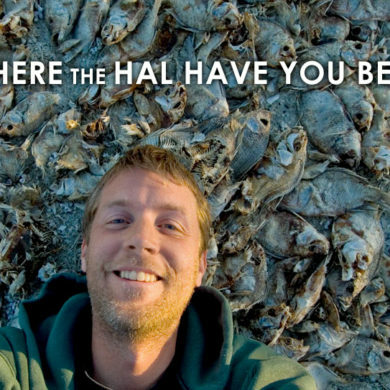 You stay out for about 8 hours and eat soup and sandwiches along the way. What’s not to love? 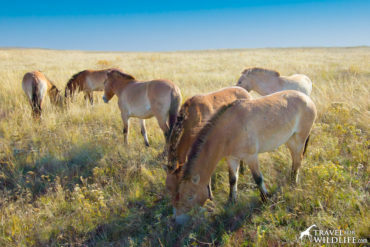 Bears aren’t the only thing to see on the tundra. 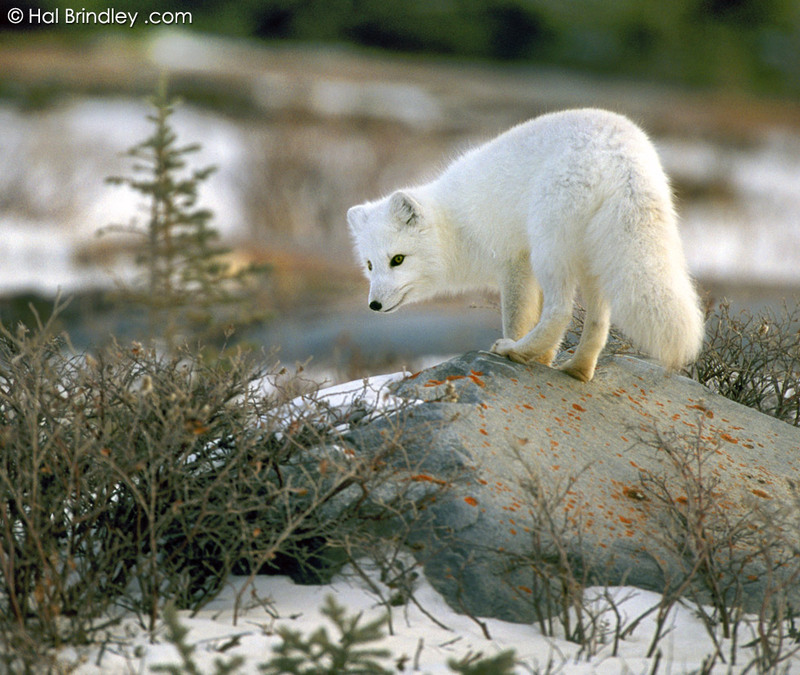 It is also common to see one of my favorite northern creatures, the arctic fox. Abigail and I rented a truck and drove around the local roads for a couple days. Our main goal was to shoot foxes. We were not disappointed. 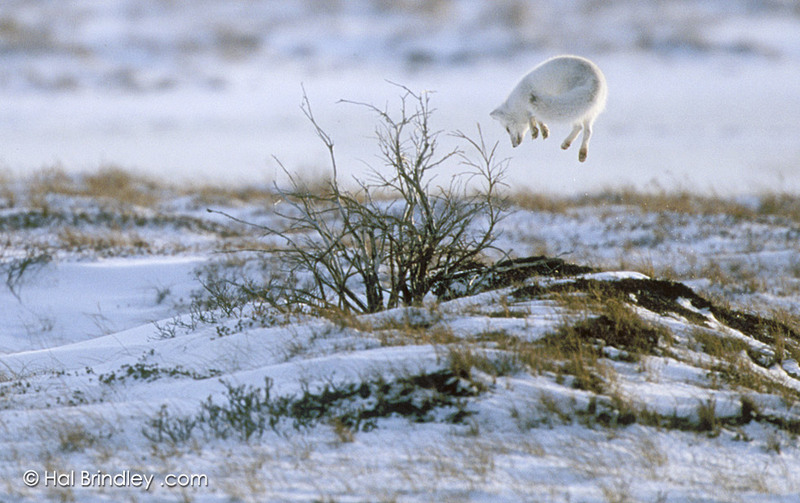 They jump several feet into the air before diving head first into the crusty snow! 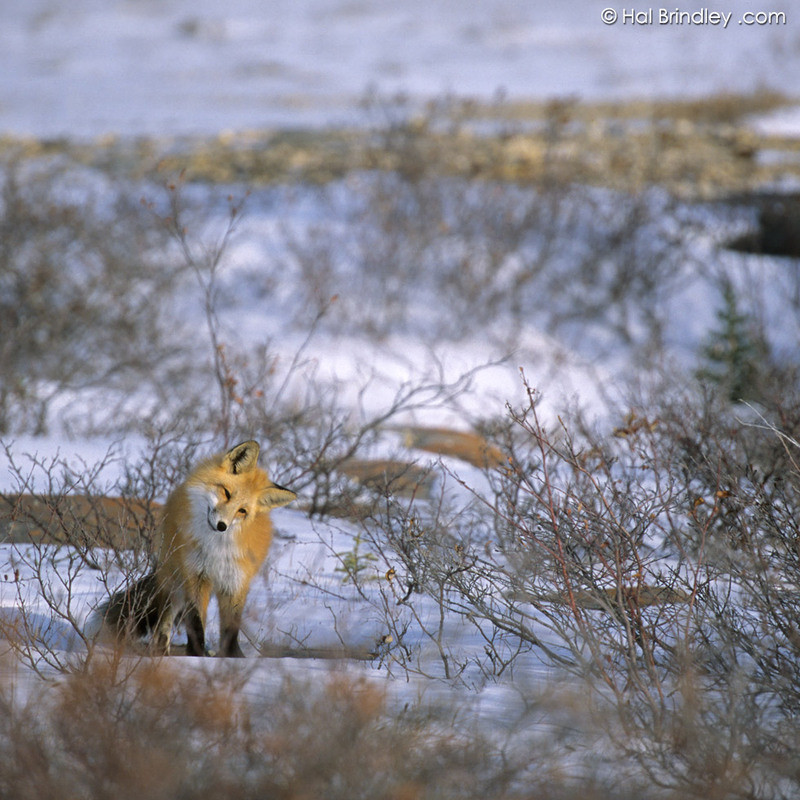 The fox shown here actually jumped up from behind this mound, making its vertical leap even higher than it appears. I knew the fox was back there and I could tell it had spotted something. All I had to do was focus and wait for the spring. We also saw quite a few red foxes. I think they are one of the most beautiful animals I’ve ever seen. This was the first time I ever got to see red foxes at close range. Here is one tilting its head. It hears a rodent under the snow. 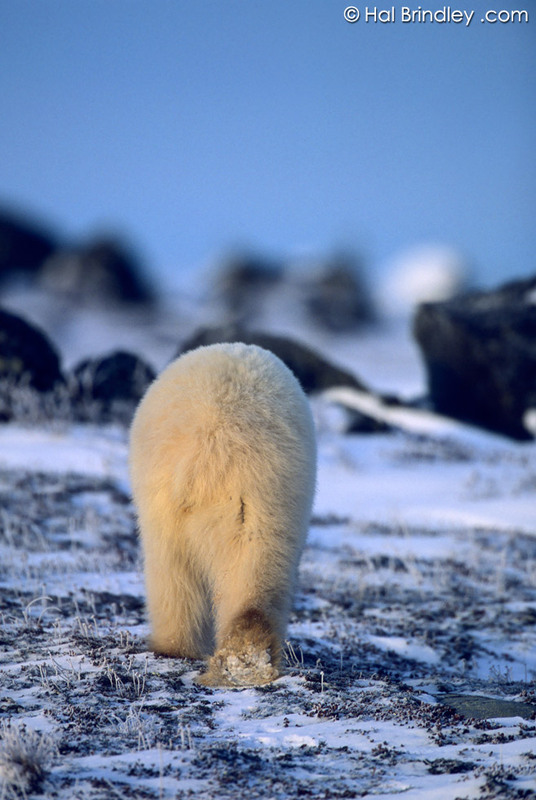 I think this is my favorite photo I shot during our week in Churchill. 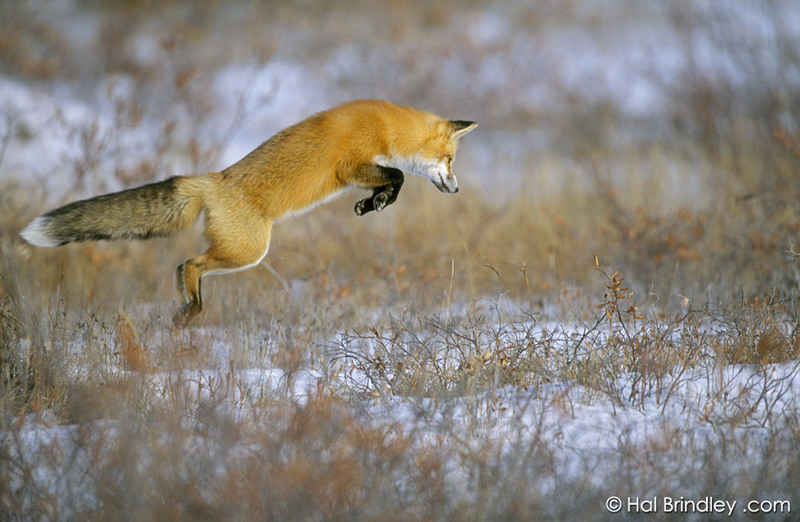 Red fox pouncing. The pounce in the previous photo led to the successful capture of this fat little rodent, probably a lemming. It was devoured in about 3 seconds flat. 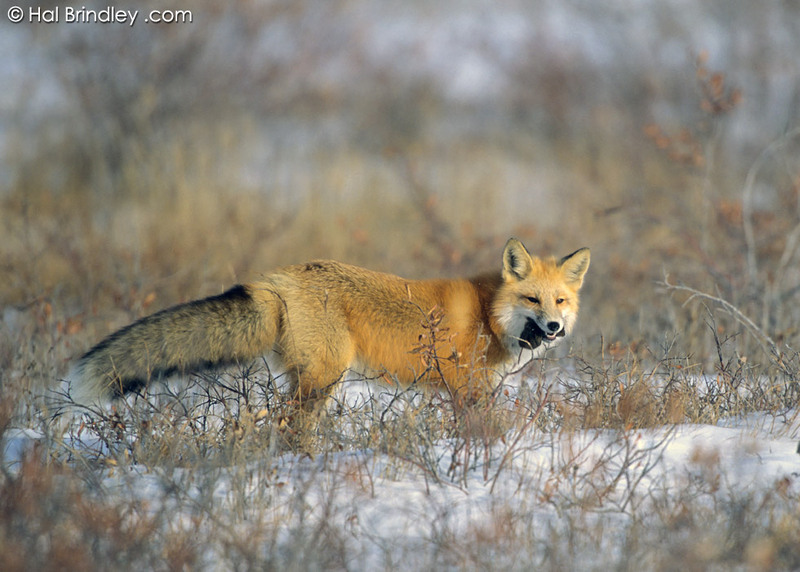 Other color forms of the red fox are also common in the area. 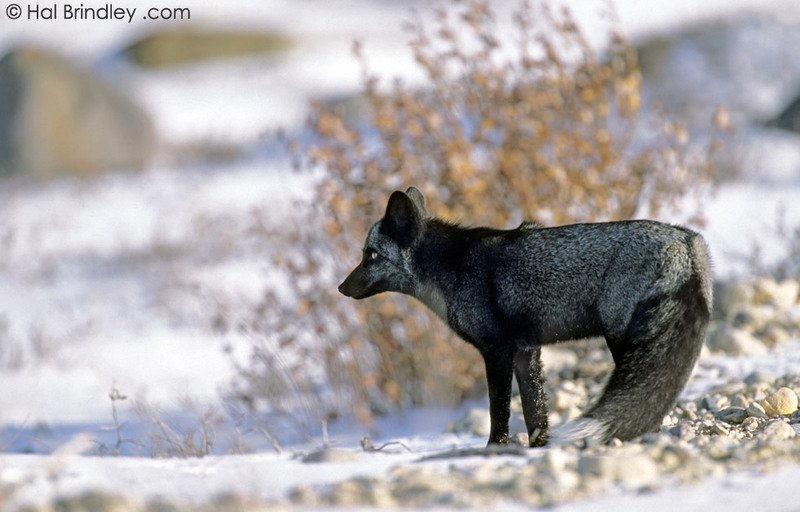 Here is a “silver” fox. 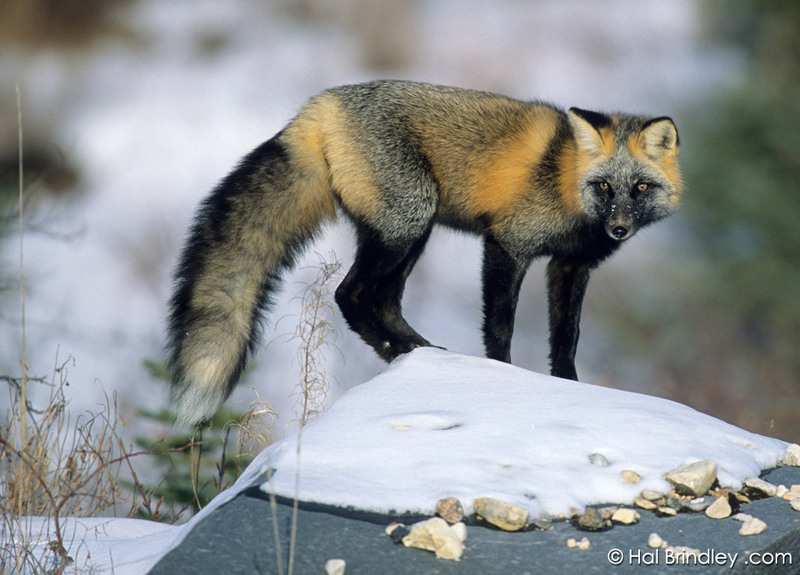 This color form below is referred to as a “cross fox”. It is half way between red and black with a dark cross shape appearing on its back. 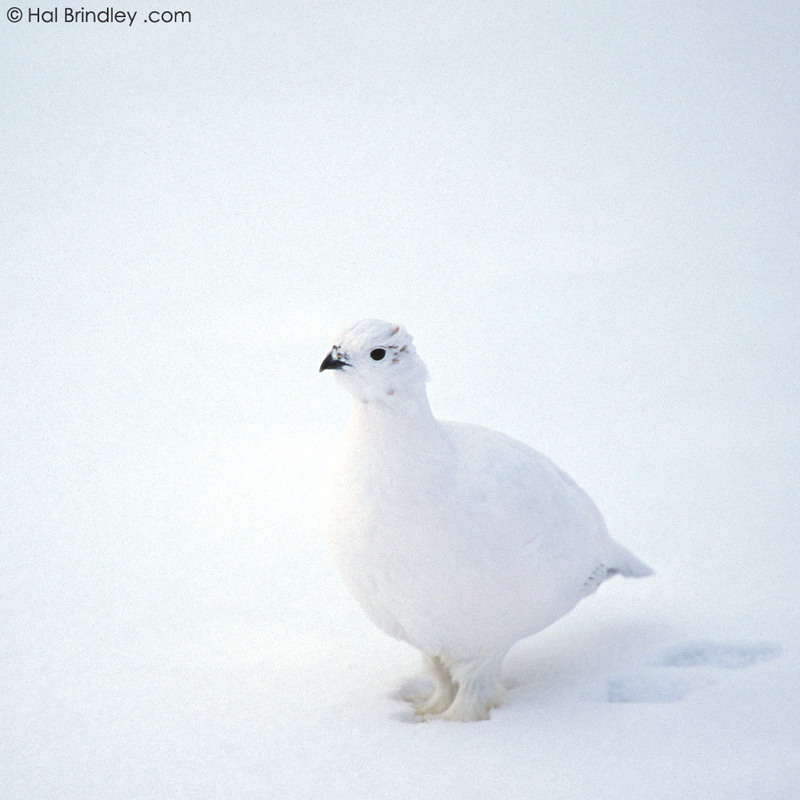 The Willow Ptarmigan is another nothern animal that turns white in the winter. Not bad camouflage eh? 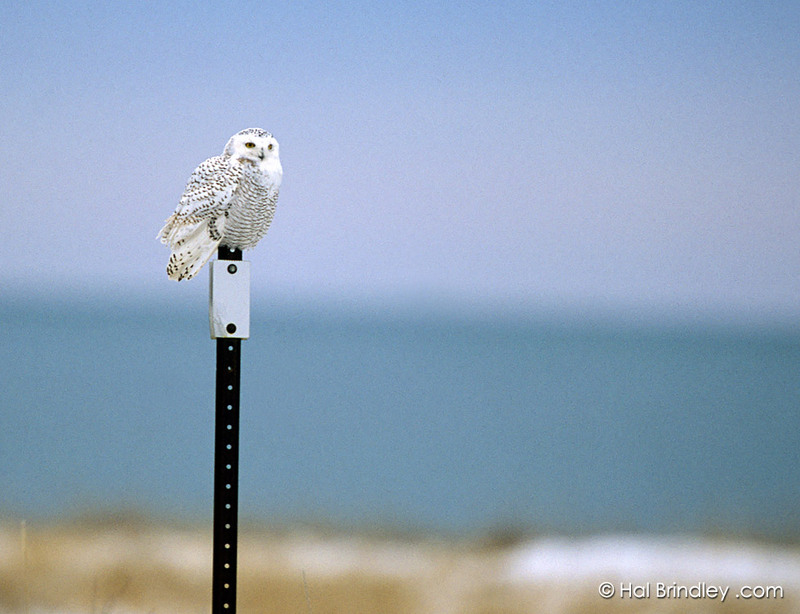 The snowy owl is a tough bird to get close to. I shot this owl facing forward out of the side of a moving vehicle traveling about 30 miles per hour with a 600mm lens. Amazingly enough it is almost in focus. 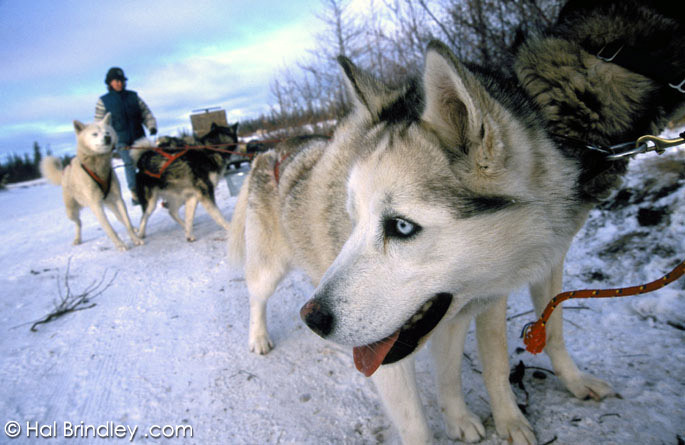 We also spent an afternoon dog sledding. I am not a fan of dogs, having been chased to near death by a wild pack at a young age. However, I was immediately enamored of these beautiful husky-malamute mixes. They absolutely love to run. It was a pretty thrilling ride for me too. The bear patrol’s job is to tranquilize or trap any problem bears that repeatedly wander into the town. 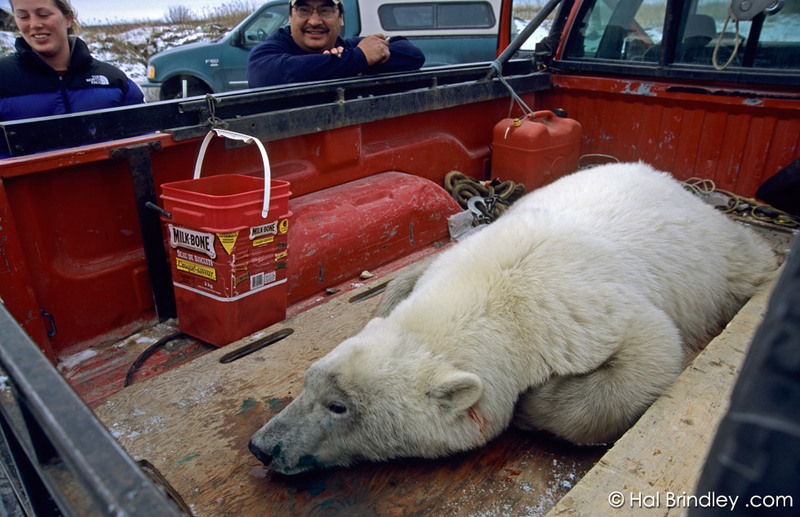 Shown here is a young bear that has been darted at the dump and placed in the back of the bear patrol’s pick-up. Attached to the back of this same truck is a bear trap containing a rather large and angry bear. The trap is a large tube of corrugated metal on a trailer. We followed these two men and their two bears to the “Polar Bear Jail”, a large metal building where bears are kept until they can be helicoptered away from town or onto the bay. The blood under its ear is from a brand new ear tag. Each captured bear receives one after their data has been collected. This is one sign you might want to pay attention to. On Halloween night a patrol is set up around the town to make sure no bears come in while the kids are trick-or-treating. Now that’s a scary Halloween. And so that brings us to the part of my story which also happens to be one of the cutest parts of a polar bear. The End.